I recently picked up a 1990 Diamond Back Expert TG, and the wheels are mismatched, the front was a Mavic rim with a Shimano RX100 Front hub, interestingly after i cleaned the hub enough, it has a prototype sticker on it, Looks old enough to be original , but got me thinking, how common is prototype parts out there in the wild. Anybody have insight on how this happens and how common it is? Me neither. And the photo makes it look like the an "oyster" anodizing, which my RX100 components definitely do not have. Maybe it's an oyster clear coat, instead? I should check and see if I still have the rims that came with the 1990 Diamond Back Expert TG I flipped years ago. I have an older style Shimano Hyperglide freehub body that has an aluminum outer shell. No, it's not anything like the 10s freehub bodies, this one mounts the normal way with the hollow bolt and shallow (Octalink?) type spline at the hubshell. Came in a box of parts from a racer at a swapmeet in SoCal. In order to increase my confidence in a prototype, I would check for a date code stamp. It there isn't one it could be a prototype. If there is one, check to see if it pre-dates the first RX100 production runs, which would have been mid-1989. 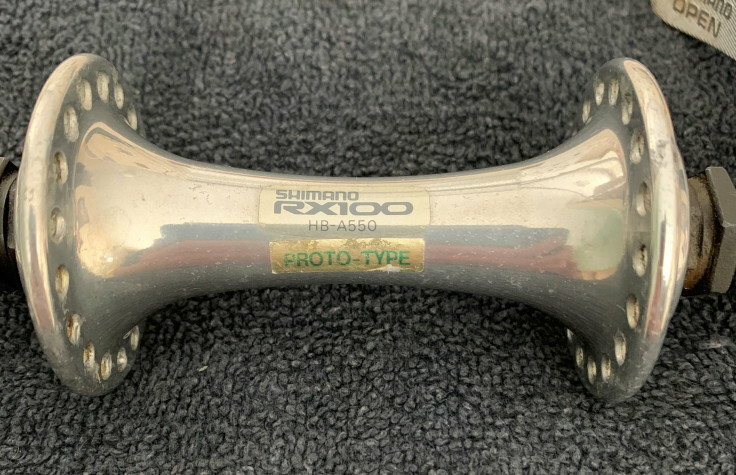 Around this time, Shimano typically stamped hub date codes on the spoke hole flanges. Here’s another proto part. 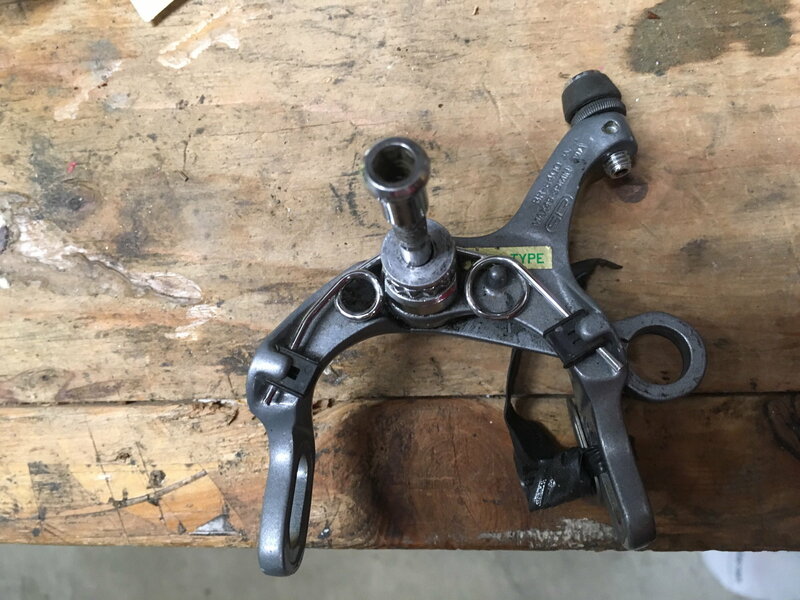 Some bits are missing as they were used to repair other brakes, but I used these proto 6400s for years on my winter bike. These are painted. I think the production brakes are anodized? The subject caliper appears to have a JA date code, which would make it January 1985. 600 Ultegra didn't debut until the 1988 model year and wouldn't have been production prior to about mid-1987. So, a JA code on a BR-6400 caliper would be a legitimate prototype. However, my recollection is that the standard production finish was a grey electrostatic paint. It looks like its NH, you were right it was on the outside of the hub flange. Typically, Shimano would have been into mass production of the 1990 model year components by August 1989. Consequently, the most likely scenario is that the label indicates a display item used at one of the trade shows. As such, it wouldn't be a true, pre-production prototype. Makes sense, Thanks for the insight T-Mar!